If we had a truly hungry child on our front door step, how many of us seriously would turn that child away without sustenance? I would venture to say anyone reading this could never do such a thing. But often times, out of sight is out of mind, and we are not exposed to the full pain of humanity. 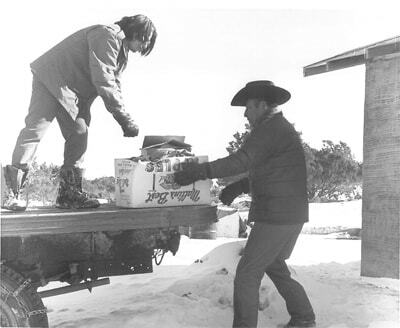 The Southwest Indian Foundation has served the hungry in various capacities for 50 years. Our Project Office on East Hwy 66 in Gallup receives individuals and families are are at the last stop, with no food or money. We are not a soup kitchen, but upon evaluating the particular situation we provide groceries and essentials to those in genuine need every day. We do have two soup kitchens, one in Gallup, and one in Tuba City, Arizona where the homeless, the destitute, and the stranded can fill their bellies without judgement or condescension. Many times we see children in the soup kitchen line. Nothing touches the heart like seeing a child in the cold winter wind weather in the soup line. We also support two food pantries, These are not only collection and distribution centers for the poor and hungry, they are also small garden centers where food is grown, and also educational centers where proper diet and good nourishment is taught and emphasized.